Gunsmoke ended in 1975 with 635 episodes. On Sunday, The Simpsons will surpass that record with the 636th episode “Forgive and Regret," in which a deathly ill Grandpa Simpson reveals a shocking secret to Homer about their past. “We never dreamed we’d get this far,” says showrunner Al Jean. “After we aired 635 this past Sunday, I was pretty confident. I thought if we made it it would be a marvelous tribute to the writers, animators and cast who work so hard; and particularly to the wonderful fans who’ve stuck with us all these years.” Jean estimates the writers have churned through 50,000 pages of scripts. “It’s the home-run record of TV,” he says. 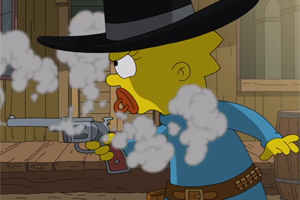 To celebrate the milestone, The Simpsons released a video of Maggie taking out Gunsmoke.